Trotta: "You will have this award for the rest of your lives and this achievement will be noted in your future whether it is on your college or job applications." (L to R): Councilwoman Tracey Edwards, Eagle Scouts Peter Recchia, Shawn Weigand, Legislator Rob Trotta, Eagle Scouts Joseph Recchia, Ryan Bornkamp and Assemblyman Chad Lupinacci. 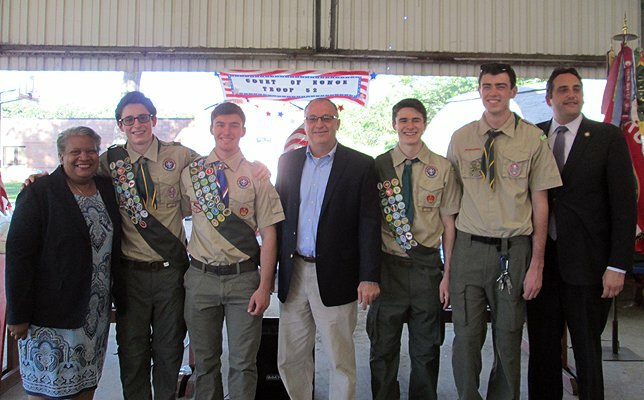 Smithtown, NY - June 27, 2017 - Boy Scout Troop 52 of East Northport held an Eagle Court of Honor for four of its scouts who attained the rank of Eagle Scout. Each one of the scout projects helped the community, as well as taught the scouts the skills of being a leader.With the assistance of their fellow scouts, they conducted fundraisers to purchase the supplies necessary for their projects. For his community project, Ryan Bornkamp built two paddle storage bins for Camp Alvernia in Centerport. Ryan donated the remainder of the funds from the project to the Camp to be used to be used to reduce the cost of attending the camp by children in need of financial assistance. Brothers Peter and Joseph Recchia completed their own individual Eagle Scout projects. Peter constructed and installed free stand sing for the Northport Nursery School and landscaped the area around the new sign. Joseph purchased a flagpole and spotlight and installed them at the Visiting Nurse Service & Hospice of Suffolk in East Northport. Shawn Weigand renovated The Dr. Burns’ Reading Garden at the Fifth Avenue Elementary School in East Northport. He also painted eight poles in front of the school to look like pencils. Shawn donated the remaining funds to the school to purchase new books for the school library. Subject: LongIsland.com - Your Name sent you Article details of "Suffolk County Legislator Rob Trotta Recognizes 4 Eagle Scouts from Boy Scout Troop 52, East Northport"